Lauren YS, also known as Lolo, is a ball of fire and creativity. Originally from Hawaii, now based in the Bay area of northern California, she spends most of her time these days traveling the world painting her own very specific style of psychedelic imagery featuring strong feminine themes and mind bending dream-like scenes. 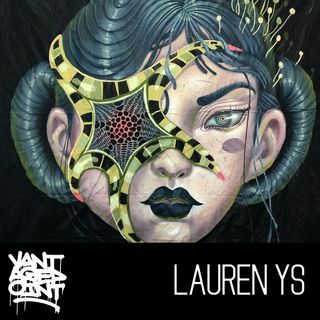 Her personality and punk-rock identity within the artworld give no indication to the surprising path she took to get here, but with a helpful spark from VantagePoint ... See More alumni Nychos a few years ago, Lauren stormed into the global mural scene and has showed no signs of slowing. After a few beers in the Lana Lane studios one evening during Pow Wow Hawaii 2018, we switched on the mics and recorded one of the most fun interviews we’ve had on VantagePoint with the wonderful Lauren YS.